Over the years I have been asked hundreds of times how I edit my photos – and achieve such smooth and buttery skin tones. The main ingredients are good “even” lighting (meaning the light source is evenly distributed across their face) and working with a professional makeup artist – but beyond those requirements I’m here to share a quick, down and dirty description of how I get great skin tones, and post-process my images. I’m a big fan of the natural makeup look – as well as a huge advocate for getting everything right from the beginning, so as to avoid having to fix anything later in post-processing. Getting an image “right” in camera, especially with your lighting is going to make a huge difference later. 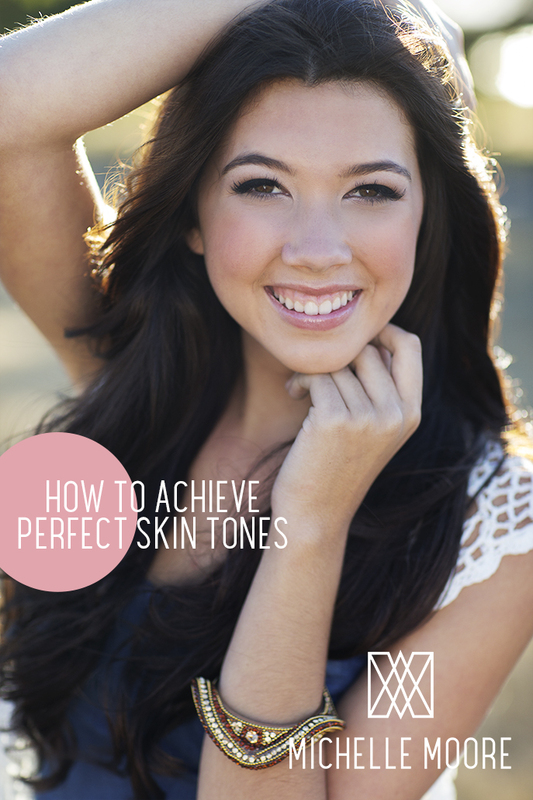 Trying to fix bad lighting is almost nearly impossible – so working on that is the first most important step to good skin tones! Secondly, not everyone has perfect skin, so I employ a professional for every single photoshoot. This saves me hours in post-production and ensures my clients look radiant and their best versions of themselves on such a special day! Don’t forget, everyone has their own shooting style, and way of processing. What works for one person doesn’t always work for another. This is how I work the best, and hopefully it can help guide you to try new things in your own post-processing and find the best method that suits your work-flow! This first image is straight out of the camera (SOOC). You can see it looks pretty good already – but it just a tad muted. There are a few small blemishes to touch up, even up some brighter areas on her hair & face – and finally give it that “pop”! This image was shot on a sunny fall day, later in the afternoon. I like to shoot about 3 hours prior to sunset, but on this particular day there had been forest fires in Eastern WA causing there to be more dust and particles in the air. It gave the light a natural diffusion. Since the sun was behind the subject (she is back-lit here) I used a reflector to even out the light on her face and make sure she was not too dark compared to her background. I exposed for the light on her cheeks. I like to over-expose just a bit, to keep everything looking bright (especially the skin) before I bring it into photo-shop. I shoot in RAW because I prefer the control it gives me. I open the RAW file in Photoshop next. Using ACR (the screen that pops up before you open your photo in Photoshop and allows you to make changes to your “digital negative”.) I make adjustments to make my image look “flat”. I get the exposure perfect, adjust the color temperature, bring all contrast out, bring back any blown out areas. This goes back to my days of working in a darkroom. I like to have a blank slate with my digital “negative” so I can correct anything in Photoshop. Bringing out the contrast in ACR allows the darkest areas more freedom so that when I had contrast later in Photoshop they don’t look as “muddy” as if I had applied the contrast in ACR. Also, getting exposure and color temperature right in ACR is best – because it’s much harder to get the right color and exposure later once working with a JPG & layers in Photoshop (hence why I much prefer shooting RAW to JPG). Once I’m in Photoshop, I fix any problems (dust spots, any shadows under the eyes). I hardly touch their skin in post because 95% of the time it’s ready to go. I never remove the shadows completely under the eye because it tends to make people look like fake plastic dolls. No brightening is done to the eyes (same reason as under-eye shadows). A little burning & dodging may occur to make the image look “just right”. I don’t use any actions, programs or software to achieve this look. 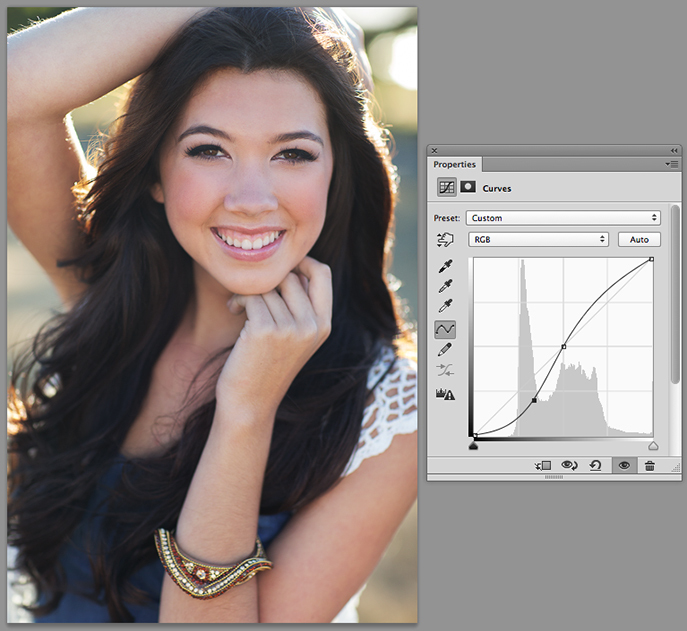 Next I use a custom made curves layer to create the contrast & POP to my images. It is a simple “S” curve that brings back the contrast I pulled out in ACR. I do this AFTER I have made any edits to the actual image so changes are made on the “digital negative” before making the final move. I strongly believe that editing an image before it has contrast will make editing easier, and allow you to see what really needs to be fixed. I feel it’s less destructive to your image. These THREE simple ingredients are all you need! • Mastery of Lighting – get out there and practice if you are struggling with this! 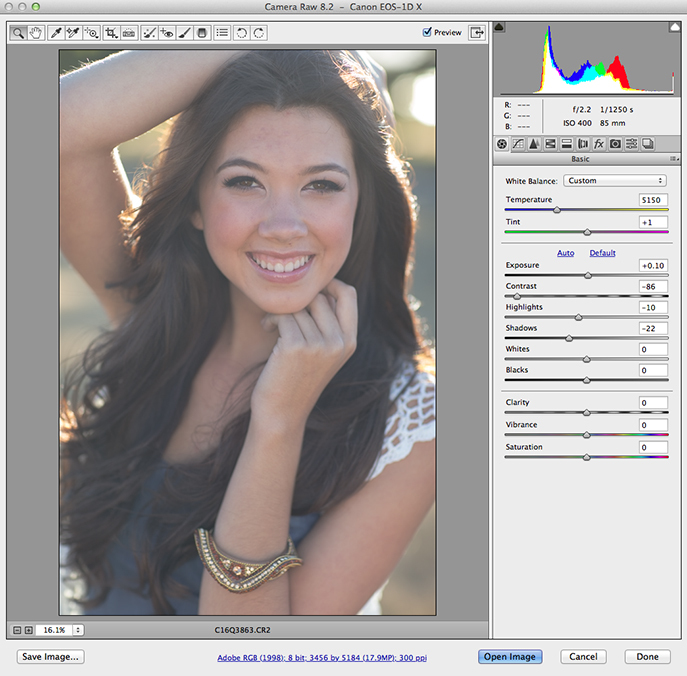 • Shooting in RAW & using the “S” Curve – Once you have the first two steps down, the Photoshop process is a snap!